A familiar name in 1970s and 1980s Peterborough, believed to be pictured outside the Halcyon pub in Westwood. Dawn Bester My Dad used to work for Steve Allen too. 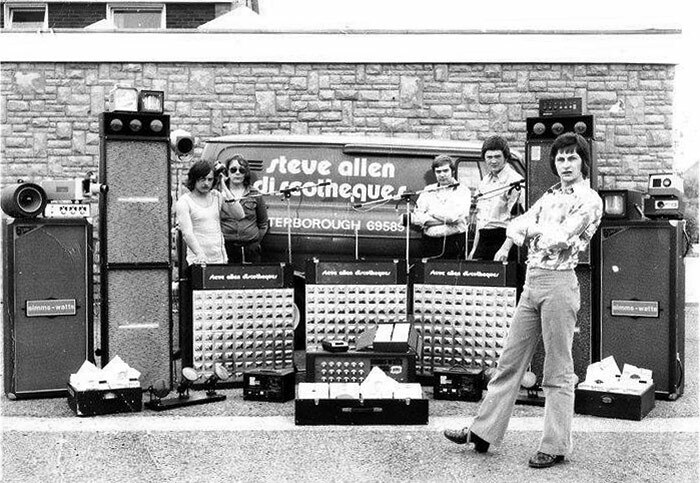 Steven Fagioli Think that’s Stuart Skipworth, Pete Mills, Dave Palmer, Dunno?, Steve Allen. Looks like the Halcyon. Dave Bradley yes it’s the Halcyon Steven ! Jane Abbott Diesn’t Stuart Skipworth do Northern Soul nights? Dave Bradley I seem to remember your face Peter, did you go to Eastholm ? Dave Bradley Thought so Peter!,you were a year or so above me , but remember talking to you at Steve Allen gigs in the 70’s and at the Wirrina ! Dave Bradley I lived on Oxney Rd and was a plumber for my dad’s firm when I left school in 75, was supposed to have left in 74 but they changed the leaving age ! Sharon Conner Steve Allen did the disco at my wedding in 1984. Steven Fagioli Yes it is. He was in the year above me at BP. Was working for Titex tooling last time I saw him at the NEC, doing a live demo. Have seen him out in Carluccios and various other places round town Julie. He used to work very near Neil at BP. Julie Kirby Havent seen him in years, next time you see him say hello for us.